Call us with your preferred dates. Galveston beachfront house in Sandhill Shores. 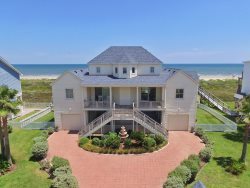 Home is 4 bedrooms, 3.5 baths, sleeps 8 with unobstructed views & private dune crossover to access the beach. Shore's Nice is spacious, light and bright and furnished with elegant, contemporary, furnishings. The kitchen is fully equipped with granite countertops, stainless steel appliances and stand-alone ice maker—perfect for stocking the cooler! Enjoy a quick meal at the large breakfast bar or relax over a delicious dinner at the dining table. The master bedroom features an en-suite bathroom with a jetted tub and shower. Every bedroom has a stunning view of the beach and accesses out to the balcony. Lounge in one of the deck chairs and catch some sun, enjoy a cool beverage, or read a book, on one of the gorgeous balconies. Challenge someone to a game of pool or gather in the living room for a game of cards after a day at the beach. This home has plenty to keep everyone entertained. Sandhill Shores is a small, quiet and coveted community on the far West End of Galveston Island.